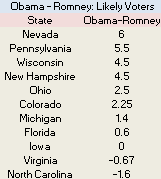 With Obama holding a narrow but consistent lead in polls of registered voters, some have begun to speculate about whether Romney would seize the advantage once polls begin to apply likely voter models. While it's possible, recent polls suggest that Obama would maintain a slight advantage. As an empirical matter, Republicans do better among likely voters since the GOP draws from high turnout groups like seniors, while Democrats depend on constituencies with low turnout rates, like young voters and Latinos. With an impressive slate of historical polling data, Nate Silver found that shifting to likely voters causes a 1.5 point swing toward the GOP. Mark Blumenthal saw a similar pattern in Pew Research’s polling. But these great pieces also point toward uncertainty: The GOP-lean of likely voter models can swing from election to election, and, given Obama’s slim lead in polls of registered voters, a smaller or larger shift could be the difference between victory and defeat. At this stage, it’s too early to gauge the exact shift, but we can say that as of right now, Obama would probably still lead if all pollsters applied likely voter models. Since Romney secured the nomination, the majority of national pollsters have surveyed registered voters. However, among those who have polled likely voters, Obama's advantage is narrower. The most recent poll from those pollsters with a likely voter screen shows Obama with a slight edge of just over 1 percent. It might be worth noting that Obama may have improved slightly over the last two months. Since June 20, Obama leads by 1 point among likely voters and 3 points among registered voters. Between late April and June 5, Obama led by 4 points among registered voters, but trailed by 1 point among likely voters. Of course, keep in mind that the number of likely voter polls is quite small. More significantly, the majority of battleground state surveys have applied likely voter screens, and the 35 likely voter surveys in the current slate of RCP battleground state averages shows Obama with a narrow but clear advantage consistent with a small national lead. In any given state, there are only a few polls, so in some instances, an outlying poll has a big influence on the average of a single state—like in Virginia, where one WAA poll showing Romney up by 5 outweighs two polls showing Obama in the lead. The only state where Romney leads in a majority of likely voter surveys is North Carolina, where he leads by nearly 2 points. So Obama appears to hold a narrow edge among likely voters. The national numbers are somewhat inconclusive due to the small number of polls, but 35 state polls combine to construct a relatively clear picture of an electoral map that is consistent with a slight advantage nationally. Obama's advantage among likely voters is far from insurmountable, and it remains to be seen whether this pattern will remain in October or September, especially since there are reasons to question the accuracy of likely voter models at this early stage. But for the moment, there isn't much reason to assume that a shift to likely voters would provide Romney with a clear advantage, even if Obama's margin is reduced.